The Freedom Trail also known as the Chemin de la Liberté marks one of several escape routes used by Frenchmen, Jews and crashed RAF airmen escaping German-occupied France over the Pyrenees into Spain. Our challenging 4-day trek takes us on a historical journey from France to Spain through the stunning Pyrenees with amazing views every step of the way. With a free day at the end to relax in the beautiful mountain town of Bagnères de Luchon. This trail begins in Saint Girons, trekking through the forest into the foothills of the Pyrenees. We then begin climbing towards the Cabane Subera high in the peaks of the Ariège before continuing towards the Col de Craberous (2,382m). The crash site and memorial of an old Halifax bomber reminds us of the wartime significance of the route amid stunning Pyrenean panoramas, clear mountain lakes worthy of a refreshing dip, wild horses, deep gullies and exhilarating ridges. To have made this trek at night, under-nourished, ill-equipped and hunted by the Wehrmacht, Austrian Mountain troops and the Milice would have been a remarkable endeavor! Throughout this historical Pyrenean trek that commemorates the bravery of others, you’ll be accompanied by a knowledgeable and experienced guide who will make sure you immerse yourself fully into the experience knowing that the day- to-day logistics are taken care of. Your guide will meet you at Toulouse Airport and transfer you to St Girons. During WW2, the town lay just inside the German imposed Border Exclusion Zone. Our accommodation for tonight is in the incredible Chateau de Beauregard. A chateau requisitioned by the Germans as their HQ for the region. This chateau that dates back to the XIX century has large quiet rooms, a spa, delightful gardens and swimming pool. We will have dinner at the Auberge d’Antan. Following an excellent breakfast, we’ll walk down to the Pont le Chemin de la Liberté (start point), inaugurated in 1995 after the old iron bridge was demolished for safety reasons. It was at this bridge that the train driver would sound his whistle, which was the signal for the evaders to jump from the moving train, where upon they were hastily collected by the Resistance and hurried into the woods. Today will be a longish, if relatively gentle warm up to this 4-day trek with only 375m of height gain. Tonight we will stay at the rustic Gite d’Etape – set in a wonderful setting in the foothills above the village of Aunac. This communal gite includes hot showers and sit down loos! We will spend the evening having a wonderful dinner al fresco with homegrown vegetables and being lulled to sleep by the owners’ donkeys! We start our day walking through old Beech forests and along a section of the GR10, before climbing over a few easy cols up to the Cabane, which lies underneath the rock wall of Le Cirque de Lameza. We will spend the night spent in the Cabane or in tents. We will only use tents if we cannot get into the Cabane, which operates on a first come first serve basis. Today we stop to pay our respects to the crew of a Halifax bomber that crashed into the Pic de Lampau. Remains of the wreckage still litter the ground and there is a simple memorial plaque set into the rock. From here it is necessary to climb the snow filled (early in the season) gully leading to the Col de Craberous (2,382m) before a steep descent for 300m and then a succession of lakes and boulder fields to reach the Col de Pouech above the manned Refuge of Estagnous. En route we should see herds of Merens ponies, the distinctive black mountain pony of the Pyrenees and Griffon vultures with a possible sighting of Lammergeier with its vast 9-foot wingspan. 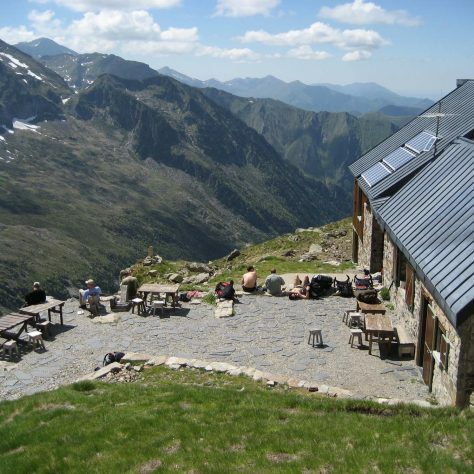 We will end the day at Le Refuge des Estagnous that lies amongst beautiful settings at an altitude of 2,245m. During our stay at this dormitory styled accommodation, we will have hot showers, a good dinner with Vino and spectacular sunset views. Road permitting. Else we will trek another 4kms to the Refuge de Fortet. We descend to Lac Rond before a 200m climb and short, slightly airy traverse to the Etang Long. From here it is about an hour to the Frontier Col at 2,522m. We descend down to the Lac de Clauere for a dip and a bite to eat, before the final descent to the Noguera Palaresa river for a pick up by minibus. We then drive to Arties for a late tapas lunch and much needed beer! We end the day with a transfer to the spa town of Bagneres de Luchon. Tonight we will stay at the charming Papilio guest house -set in a stunning location with the most fantastic views of the surrounding mountains. The guest house has large comfortable rooms and a pretty garden where you can sit and enjoy the spectacular views. We shall have enough provisions in our daypacks for a bite at the Lac de Clauere. Today is a free day in the wonderful spa town of Bagneres de Luchon. There are many lively bars and restaurants to spend away a lazy day. Or why not treat yourself to an hour in the hot caves of the themes. We will spend the night in the charming Papilio guest house. Today we will start our journey back home with a transfer to Toulouse Blagnac Airport. Clothes for the evening such as casual shorts, T- shirts etc. Each morning you will fill your water bottles/bladder from the chateau / gîte / refuge. We pass streams in various places that you can top up from if you should run out, so take purification to add to it in the form of silver chloride or chlorine. What is the food like in the refuges? The food in the refuges is plentiful and of very good quality,often using locally sourced ingredients. Breakfasts consist of pastries, fresh bread and jams and you can expect a three course meal in the evenings. Can allergies be catered for? What are the gîtes and refuges like? Each have dorm style accommodation but each person will have their own bed (bunk). It is worth remembering that these places are not designed for luxury but rather a safe place to rest whilst in the mountains. They are clean and comfortable and are a great place for socialising with like-minded trekkers. How tough is this trek? Just because we’re in Europe and reasonably close to home, it doesn’t mean that you’re undertaking a gentle walk in the hills! This is a fairly challenging trek with significant altitude gain and some long days, including a fixed rope on a steeper section. Worth thinking about when you consider that the escapees of the war had none of this assistance, and often did all the walking in the dark to avoid capture! 360 Expeditions have conducted detailed risk assessments and put the necessary plans in place to cope with any accidents or illness whilst out on the trek. Our expedition leaders are highly qualified and experienced mountain leaders who hold expedition first aid qualifications and are used to working in remote environments. Their training, allows them to deal with situations quickly and safely. Should someone find themselves requiring further medical attention, the leader will organise for that individual to be taken from the trail and transferred to the nearest hospital. The leader and the 360 office team will also be on hand to offer guidance and support for insurance claims and contacting next-of-kin. Is there any risk of altitude sickness? There is no risk of altitude sickness on this trek. What sleeping bag do I need? The idea is to be as comfortable and warm as possible for the night and henceforth to ensure plenty of sleep for the arduous days ahead. A 3 season sleeping bag with comfort rating of 0C will do the trick just fine. The refuges also provide clean blankets so you could simply take a sleeping bag liner. What boots do we need? Because of the huge variety of terrain encountered walking in these mountains it is very important to wear the right footwear. Boots should be sturdy, waterproof, insulated against cold temperatures and offer adequate ankle support. In addition it is highly recommended that your boots are well worn in to prevent the formation of blisters. A wide range of suitable boots are on the market and further advice as to which brand names are available can be found online or at your local outdoor store. The leather / Goretex combinations are endless and each with their merits. Our best advice is to try them on – if you think they’re comfortable, and will be for several hours a day, buy them. It is not necessary to buy technical boots with crampon clips as crampons are not used for climbing this trek. Do we need crampons and ice-axes? You will not need crampons and ice axes for this trip. How much weight will I be carrying in my rucksack? You will only have to carry your own kit for most of the trip but on one day you will need to carry some camping equipment and extra food supplies. For this reason you should pack as lightly as possible and only bring the essentials. You can expect your pack to weigh around 10kg when fully loaded so ensure you train with this in mind and get used to carrying a rucksack for long periods of time. Do I need a down jacket? A down jacket is not essential, a good thick fleece or jumper will suffice for the evenings. During the day temperatures can be warm and can even reach to the mid 20 C. In the evening higher up, it could drop to below freezing and have a distinct chill in the air. As you will be trekking in a mountain environment, the weather can rapidly change for the worse so you need to be prepared for all conditions. Even in good weather it is not uncommon to have short heavy downpours or heavy snowstorms. Flights aren’t included what time should I arrive and depart to Toulouse? We haven’t included flights as this gives you options from the UK. There are many flights that come to Toulouse daily from many different airports. We will be at the airport at 11.30 am on day one of the itinerary. Please therefore find flights that work for these timings. If there are any issues with this please let us know and we will also try and help however it might mean in getting a hire car/train or taxi to your start / finish point. Bagneres de luchon is 1h 40 mins drive away. Any tips on how a trekker can maximise their chances of success? The 360 training programs have been devised to be expedition specific. Use these as a guide but also feel free to contact us for individual advice on how to best incorporate the best suitable fitness program with your own lifestyle. You will be able to get WiFi at the chateau/guest house at the start and finish. The gite/refuge generally don’t have WiFi due to their remoteness. Mobile phones work in most places on this trek but there are a couple of areas where you may struggle to get reception. Can I charge my phone/iPod during the trek? The gîte/refuge do have electricity so you will be able to plug things in to charge, but depending on how busy the gite/refuge is, you might find yourself competing for a socket with other guests. What plug sockets do you have? France and Spain use the continental two pin with earth prong, adapters are readily available from many outlets before you leave the UK. The whole expedition was seamless. I’d never attempted anything like this, but the pre-communication was perfect, right from the moment when the company (very fairly) honoured the pre-Brexit prices. Marni and Helen answered every possible question, and the FB group was a great source of info and an opportunity to meet other members of the team.